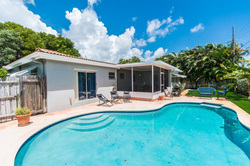 Attractive vacation home rental located in Fort Lauderdale near Lauderdale by the Sea, a popular beach town for families and travelers alike. Located in the Fort Lauderdale area, this fully furnished home is easily accessible from I-95 and Florida’s Turnpike. This property has been updated with completely new furnishings from plasmas to the kitchen appliances, designed with an eye for the contemporary. 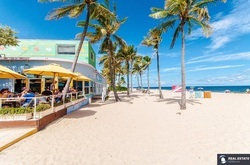 The location is central to downtown Fort Lauderdale, famous Las Olas and neighbors north Fort Lauderdale with assorted dining options such as Bonefish Grill, Sette Bello, Bonefish Mac’s and Kaluz. Each of these range from fine dining to a more casual atmosphere depending on your interests. The master bedroom hosts a king size bed, plasma TV and walk out sliding doors to the pool area with it’s own bathroom. The second bedroom also with a flat screen tv has a full size bed. The third bedroom suited for children has bunk beds with a full mattress on top and a twin below. This room can easily be converted however often we have families that enjoy this property so it was a natural to continue its decor. This vacation home maintains an open floor layout with a full kitchen looking out to the patio, the family room area is host to a new plasma TV and is perfect for relaxing after a memorable day at the beach in Lauderdale by the Sea. The encased outdoor pool patio is great should a light sun shower blow in, the gas grill and private pool area is perfect for entertaining friends and family. Downtown Fort Lauderdale is a short drive, don’t miss Blue Martini, P.F. Changs and True Luxs on the way housed in Galleria Mall host to a variety of major stores and boutique designer apparel stores. 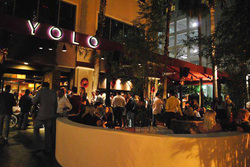 In Downtown Fort Lauderdale consider YOLO, The Guilded Pig and famous Las Olas which has Solitas, American Social and exciting Local Events. Check us out on Homeaway! Check us out on Vacation Rentals!